I have been to Occoquan Bay National Wildlife Refuge dozens and dozens of times, but had never seen an opossum there until yesterday. I am pretty sure that I would not have seen this one almost hidden in the trees if fellow photographer Ricky Kresslein had not pointed it out to me. Initially I was incredulous, suspecting that he had misidentified a raccoon, but as soon as I looked closely at the animal, I realized he was right. The Virginia Opossum (Didelphis virginiana), the animal that I photographed, is the only marsupial found in North America north of Mexico. I had to double-check, but was able to confirm my remembrance that a marsupial is an animal with a pouch, like a kangaroo or a koala. The connection to Australia and New Zealand is occasionally a source of some confusion, because the “possums” in those locations are entirely different species. Here in North American, “opossum” and “possum” are used interchangeably. 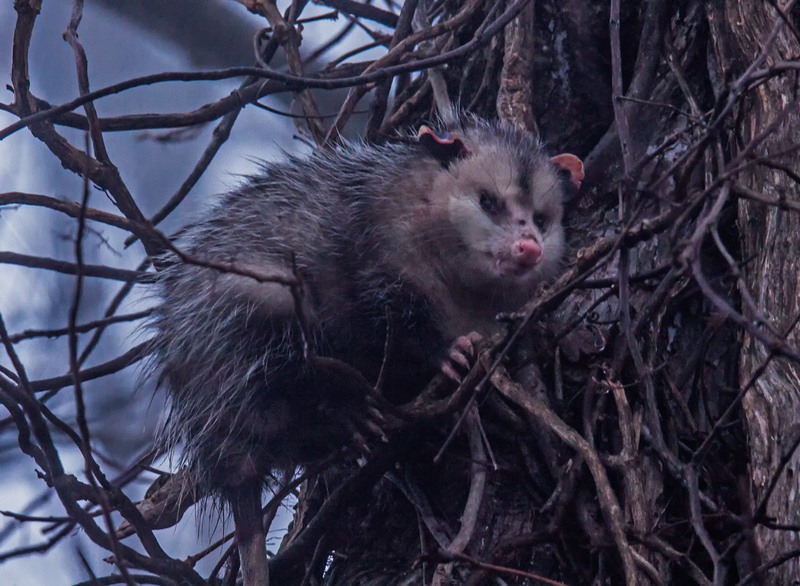 One of the most common references to this animal is the expression “playing possum.” In the literal sense, it refers to the Virginia Opossum’s reaction sometimes when threatened—it may roll over, become stiff, drool, breathe slowly and shallowly, and appear to be dead. In a more general sense, the expression has come to mean pretending to be dead or asleep to avoid having to deal with a problem.